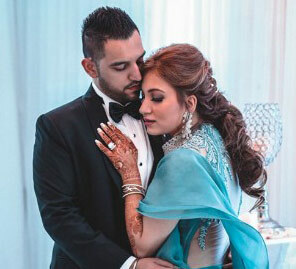 A sandy beach, scenic environs, and standout decor made Sindhu and Manoj’s Thailand wedding a treat for all the senses. Thailand is a beach lover’s paradise. 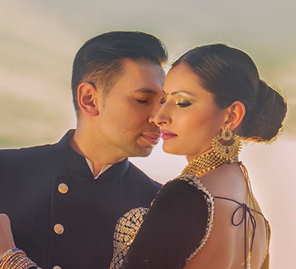 Sindhu and Manoj loved the idea of taking their vows on a sandy shore and found the Rayong Marriott Resort & Spa to be the perfect place for their dream nuptials. Their photographs are proof of the fun and joy at this special occasion meticulously planned by WeddingSutra Favorite - Bling Mushrooms. Here, we share all the interesting details of their destination wedding. Manoj lives in the US. For over six months, Sindhu and Manoj’s parents hounded them to meet. One day Manoj decided to call Sindhu, and they hit it off well. When they both spoke, Manoj was based in the UK, and Sindhu lived in Hyderabad. After talking for three to four days, they decided to meet. Without informing their parents, they both flew down to Mumbai and enjoyed the weekend together. The parents were so confused when the couple met with the entire family as they were extremely comfortable with each other. They told their parents they wanted to date for four to five months before they got engaged. Sindhu went to London and expected Manoj to propose, but he didn’t. But then he flew down to Hyderabad. When they were relaxing in his room, she suddenly she saw Manoj go down on one knee and propose. She couldn’t stop laughing and was glad that the surprise element was something he got right! The couple wanted a wedding abroad, ideally on a beach. They had Bali in Indonesia and Thailand as their options. However, since it rains in Bali in February, their wedding planner suggested that they avoid getting married there. When a friend suggested the Rayong Marriott & Spa property, Sindhu fell in love with it. The location was convenient for their guests; there were warm, sunny beaches, multiple venues to explore and a beautiful ambiance all around. The bohemian decor was the highlight of the mehndi function. Beautiful dream catchers, tents, and traditionally designed Thailand umbrellas added color to the ambiance. Sindhu chose to keep the colors subtle for her attire and picked a pastel palette for the guest’s dress code. As a result, everyone wore pastel shades and solid colors for this fun function. The couple wanted to keep a very glitzy theme for the cocktail party. Black, gold, and metallics were the decor highlights, and everyone came dressed in glamorous gowns and suits. The couple organized a pool party so that the guests could chill with brunch, food, and volleyball before the wedding ceremonies commenced. Pink and green decor with flowers was the highlight of this sunset wedding. The mandap was rustic in its vibe and was set up on the sandy beach. Sindhu was a part of the baraat because she didn’t want to miss the fun. Manoj and Sindhu didn’t want a typical bride-groom entry, and instead of entering in a car, they decided to walk down the aisle together during the baraat and then for the main ceremony as well. Long tables and white decor with lanterns and a canopy of light bulbs set the theme for the evening. The beautiful set up was done in a hilly area within the hotel grounds called Kohpha Hill. The after-party was held after the dinner at the hotel club.